Because we are thinking about Thanksgiving and gratitude, I hope you all can read the story of Molly's Pilgrim by Barbara Cohen to your grandchildren, or even just for yourselves. The story is of a third grade Jewish immigrant from Russia at a new school in the U.S. The other students in her class make fun of her. The story unfolds so that the students, the teacher and Molly end up feeling good about one another. Themes of the story include conflict, self-esteem, communication, and bias. A century ago, in 1913, the world’s finest golfers gathered at The Country Club in Brookline, Massachusetts, to compete in golf’s national championship, the U.S. Open. 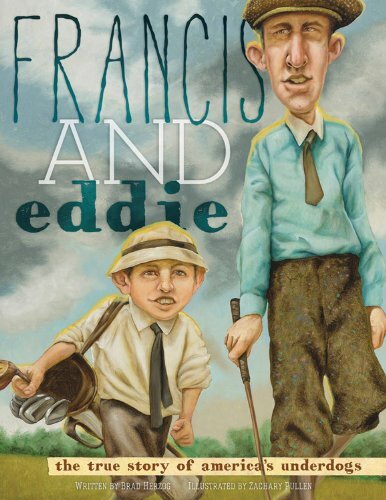 Joining them was a little-known amateur, 20-year-old Francis Ouimet, who lived across the street from the course and taught himself to play by sneaking onto the fairways with the only golf club he owned. His caddie? Ten-year-old Eddie Lowery, who stood only four feet tall. Together, against their idols and in front of a crowd that grew from a handful of spectators to a horde of thousands, they attempted to pull off the impossible. Along the way, they forged a lifelong friendship. Marcy's life is a mess. Her parents don't understand her, she feels like a fat blimp with no friends, and her favorite teacher just got fired. Ms. Finney wasn't like the other teachers, and she was helping Marcy feel good about being herself. Now that she's gone, Marcy doesn't know what to do. She's always thought things would be better if she could just lose weight, but the loss of Ms. Finney sparks something inside her. She decides to join the fight to bring back her teacher, and in doing so, she discovers that her voice might matter more than she ever realized. With issues that still resonate strongly today and a character millions of teens have connected with, we are thrilled to celebrate the 30th anniversary of The Cat Ate My Gymsuit. Cancer, Cancer Go Away is a book by Amy Kite that was written to help comfort kids when they learn that a friend, neighbor or loved one has cancer. With colorful graphics and a rhyming scheme, the book provides young readers with an honest and hopeful message while it helps to answer some very tough questions. The book was written when Kite observed her community’s response to a young boy’s diagnosis of leukemia. “When the brave boy known as Superman Sam got sick, it seemed as if the whole world came together to grieve and to offer support and love,” Kite said. “Young children, including my own three, wanted to help, cry and talk about the unknown.” Kite said she was inspired to write the book because of Sam, and she hoped that it would provide some comfort to the many kids who felt lost and scared. Before she passed away in 2007, Dr. Carolyn Goodman collaborated with author Brad Herzog to recount a life of courage and conviction, love and loss, tragedy and triumph. A half century after the "Mississippi Burning" murders, this is the first time that a victim’s family member has expounded about the experience and the myriad emotions—from guilt to resolve—that it spawned. More than simply a memoir, My Mantelpiece is the story of a century’s seminal progressive movements seen through the lens of a remarkable woman’s singular journey. Bubbie is the Yiddish word for grandmother, but a Green Bubbie is an energy-efficient model of grand-parenting. Whether or not you have your own children or grandchildren, you too can be a Green Bubbie—the secret is to know how to nurture those who are growing right in front of you! And if you’re lucky enough to meet a Green Bubbie, she will become the “accidental relative you meet on the road to finding yourself.” Whether you’re a Green Bubbie or one of her “sprouts,” you can become part of the very special world of organic, inter-generational relationships. Jon J Muth blends a traditional European folktale with elements of Chinese folklore and the Buddhist story tradition in an inventive retelling of the "Stone Soup" story. The three monks Hok, Lok and Siew (deities from Chinese folklore) wander into a village where hard times have closed the doors of trust, so that even neighbors are suspicious of one another. Only one small, brave girl is willing to approach them. The monks describe their plan to make stone soup, and the child willingly helps. Curiosity draws villagers out of their homes, and soon one person after another is bringing something to add to the pot-carrots and spices, pea pods and gingerroot, mung beans and taro root. The monks are not only helping the villagers make soup, they are helping them open their hearts to one another and build a sense of community. "With the gifts you have given, we will always have plenty. You have shown us that sharing makes us all richer." In an author's note, Muth notes that in the Buddhist tradition, tricksters seek to spread enlightenment rather than gain anything for themselves. Suds is a boy entering third grade. Mrs. Simms, his teacher, challenges her students to be kind, considerate, hard working and to behave in and out of school and will reward those that abide with a halo. While this charming story focuses on Suds, aka George trying to be the first student to get the halo I enjoyed the relationship between Suds and his mom even more. Loved the fact that he earned his nickname from the enjoyment of relaxing in the tub. Loved the limited but important things the dad had to say and totally loved his mom and her words of wisdom. The writing is perfect for second grade and up and reluctant readers will enjoy the humor, the illustrations and the short chapters. Readers will enjoy Jerry Spinelli's newest book and will probably search for his Fourth Grade Rats (Third Grade Angels is actually a prequel) to continue reading about Suds. Read as an ebook arc courtesty of Scholastic via Netgalley.